I’ve put a question mark after the title this week, since I wouldn’t want anyone to believe that I think there’s actually such a thing as a ‘magic recipe’ for writing a short story. It’s a mighty subtle form, and no list of ingredients and mixing instructions will guarantee success. But looking at how different writers approach the form is one way we can learn, especially if we’re able to study their technique without dissecting it so thoroughly it dies in our hands. In my last blog we looked at voice-led short story writing, where the distinctive (and often instantly recognisable) voice of the writer carries the story. In writing now about character-led stories, I’m not suggesting that voice, plot and setting aren’t present or important, but that it’s character that takes centre stage. These stories leave us identifying with the emotions, perceptions and experiences of one or a handful of characters, often understanding as a reader far more about their situation than the characters themselves seem able to. What strikes me about the character-led story is that the writing style can sometimes seem unremarkable and unmemorable, which leads me to ponder whether allowing style to retreat into the background is part of the ‘magic trick’ of character-led writing. Here we’ll take a look at four great exponents of the character-led short story. In William Trevor’s 1993 story Timothy’s Birthday, Eddie, Timothy’s lodger and lover, drives out to Timothy’s elderly parents at their dilapidated country house to explain that their son is unwell and won’t, for once, be spending his birthday with them. The story is, as always with William Trevor, understated, and captures the exquisitely painful poignancy of a relationship that has broken down long ago. The story is told in third person, sometimes from the point of view of Charlotte and Odo (the parents) but mainly from Eddie’s point of view. ‘I’d fix that toilet for you,’ Eddie offered, explaining that the flow to the bowl was poor. Nothing complicated, corrosion in the pipe. He explained that he’d started out as a plumber once, which was why he knew a thing or two. ‘No sweat,’ he said. When lunch was mentioned he said he wouldn’t want to trouble anyone but they said no trouble. He picked up a knife from the drinks table and set off with his gin and tonic to the downstairs lavatory to effect the repair. Trevor achieves an astonishing amount in that deceptively simple piece of writing. We know, without being told, that Eddie’s plumbing ability is likely to be limited; we know that he wants to stay for lunch, and that Timothy’s parents don’t really want him to; and Eddie’s decision to take his gin and tonic with him to ‘effect the repair’ serves to confirm our understanding. 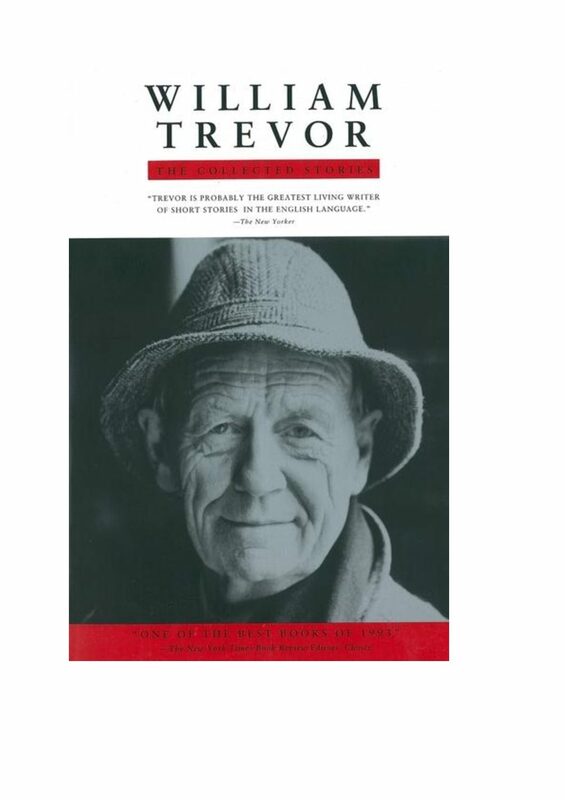 In [this] recent piece from the Irish Times, William Trevor’s son talks about his approach to writing, and his love of characters. In the title story of her 2009 collection The Thing Around Your Neck Adichie uses a second person voice to tell the story of a twenty-two-year-old woman’s arrival in Maine from Nigeria. In the USA she experiences prejudice, abuse and the constant strain of being ‘other’. She also finds love from an unexpected quarter. Her vulnerability is conveyed powerfully yet coolly: this is not a character weighed down with self-pity, but someone determined to be herself against powerful odds. Nobody knew where you were, because you told no one. Sometimes you felt invisible and tried to walk through your room wall into the hallway, and when you bumped into the wall, it left bruises on your arms. Once, Juan asked you if you had a man who hit you because he would take care of him and you laughed a mysterious laugh. At night, something would wrap itself around your neck, something that very nearly choked you before you fell asleep. The mysterious laugh is important. She is a character who does not show her feelings to the world. [This] is the author’s website. Kitty is in her forties, divorced with two grown-up sons who still live with her in Enright’s story In the Bed Department from her 2008 collection Taking Pictures. Kitty works selling beds in a Dublin department store. She’s unsettled by the installation of escalators, by an unexpected visit from her mother, by an affair with an older man which leaves her, maybe, pregnant. We’re firmly in Kitty’s point of view, and Enright conveys cleverly Kitty’s apparent lack of introspection while allowing us, as readers, to see how deeply she understands herself yet determinedly denies that understanding. At first she thought it was the change of life. She stood in the bed department and waited for hot flashes. She did not mind growing old as long as it meant growing easy, but it did not seem to be working out that way. There was an agitation, a turbulence in her blood. She rode all the way up to accounts to query her payslip, and she landed back in the bed department with a thump. She walked the floor and sat on the beds. She had a terrible need to lie down on one of them. During stocktaking, she actually did lie down. She simply reclined. She let her back sink into a double-sprung Slumberland, and felt she might never rise again. The randomness here of Kitty querying her payslip gives the passage its shape, and tells us more about Kitty’s state of mind than her sudden tiredness. As with all good short stories, it gives us, the reader, space to speculate, to fill the gaps. Ford’s writing has long fascinated me, for he seems to have no distinctive style or technique yet his writing is always memorable, believable and often moving in a quiet, sustained way. In his story The Womanizerfrom his 1997 collection Women with Menhe tells the story of Austin, an American visiting Paris who has an affair with a single mother. The story has a shocking ending, which I won’t spoil by revealing here. The real genius of the story lies in the fact that we are in Austin’s point of view throughout, and have enough sympathy for him to be pleading with him to behave differently, while knowing that he is irredeemably selfish, misogynistic and foolish. The next day, though, he called on her. He had nothing special in mind, just an aimless, angling call. Maybe he could sleep with her – not that he even thought that. It was just a possibility, an inevitable thought. When he asked if she would like to see him again she said she he would if he wanted to. She didn’t say she’d had a good time the night before. She didn’t mention that at all – almost, Austin felt, as if that time had never happened. But it was an attitude he found attractive. She was smart. She judged things. It wasn’t an American attitude. In America a woman would have to seem to care – more, probably, than she did after one harmless encounter. Here Ford brilliantly displays Austin’s neediness, his prejudices and his sense of entitlement. Note ‘maybe he could sleep with her – not that he even thought that’, revealing to the reader that Austin thinks precisely that, though knows he shouldn’t. Next time we’ll look at ‘place-led’ short stories. There are some real gems.